Despite improvements in intensive care and dialysis, some experts have concluded that outcomes associated with acute renal failure (ARF) have not improved significantly over time. ARF was studied in hospitalized patients between 1988 and 2002 using the Nationwide Inpatient Sample, a nationally representative sample of discharges from acute-care, nonfederal hospitals. During a 15-yr period, 5,563,381 discharges with ARF and 598,768 with ARF that required dialysis (ARF-D) were identified. Between 1988 and 2002, the incidence of ARF rose from 61 to 288 per 100,000 population; the incidence of ARF-D increased from 4 to 27 per 100,000 population. Between 1988 and 2002, in-hospital mortality declined steadily in patients with ARF (40.4 to 20.3%; P < 0.001) and in those with ARF-D (41.3 to 28.1%; P < 0.001). Compared with 1988 to 1992, the multivariable-adjusted odds ratio (OR) of death was lower in 1993 to 1997 (ARF: OR 0.62, 95% confidence interval [CI] 0.61 to 0.64; ARF-D: OR 0.63, 95% CI 0.59 to 0.66) and 1998 to 2002 (ARF: OR 0.40, 95% CI 0.39 to 0.41; ARF-D: OR 0.47, 95% CI 0.45 to 0.50). The percentage of patients who had ARF with a Deyo-Charlson comorbidity index of 3 or more increased from 16.4% in 1988 to 26.6% in 2002 (P < 0.001). This study provides evidence from an administrative database that the incidence of ARF and ARF-D is rising. Despite an increase in the degree of comorbidity, in-hospital mortality has declined. Acute renal failure (ARF) is one of the most common and serious complications of hospitalized patients. Our understanding of the epidemiology of ARF has been limited by the lack of a uniform definition of ARF and the preponderance in the literature of relatively small, mostly single-center studies. As a result, estimates of the in-hospital mortality associated with ARF have ranged widely. Even among studies of a homogeneous group of patients such as those who were admitted to the intensive care unit (ICU) with ARF that required dialysis (ARF-D), mortality rates have ranged from 44 to 79% (1,2). Little information exists on secular trends in the epidemiology of ARF. There are several reasons to suspect that ARF may be more common now than previously: The increasing age and comorbidities of the hospitalized population (3); an increase in the prevalence of risk factors for ARF, such as chronic kidney disease (4) and diabetes (5); and more widespread use of intravenous contrast for cardiovascular procedures (6). Whether the outcomes of patients with ARF have improved in recent years along with advances in critical care medicine and dialysis technologies is controversial. Many reviews of ARF have adopted a pessimistic view, citing studies that were performed during different time periods to argue that mortality rates that are associated with ARF have not changed over several decades (7–9). A systematic review of 80 studies of ARF involving 15,897 patients between 1970 and 2004 concluded that mortality rates have remained unchanged (10). The handful of studies that have specifically examined mortality rates of ARF over time have been small (N ≤ 710) and have yielded conflicting conclusions (11–17). Using the Nationwide Inpatient Sample (NIS), a large and nationally representative administrative database of hospital discharges from 1988 to 2002, we attempted to determine secular trends in the incidence, in-hospital mortality, length of stay (LOS), and disposition (discharge to home versus posthospital care) for patients with ARF and ARF-D. The NIS is the largest all-payer administrative database of hospitalizations in the United States. From 1988 to 2002, the NIS has provided data annually from 5 to 8 million inpatient stays. The NIS captures patient-level data from a 20% stratified probability sample of US hospitals from states that participate in the Healthcare Cost and Utilization Project. Included in the NIS are teaching and nonteaching hospitals, specialty and general hospitals, and pediatric and adult hospitals. Excluded are long-term hospitals, psychiatric hospitals, alcohol and chemical dependency treatment facilities, and short-term rehabilitation hospitals. The NIS provides data on patient demographics, hospital characteristics, in-hospital mortality, disposition, LOS, and up to 15 diagnosis and 15 procedure codes that are based on the International Classification of Diseases, Ninth Revision, Clinical Modification (ICD-9-CM). The database has been used for a variety of clinical investigations, including studies of secular trends in health care utilization and clinical outcomes (18–20). We identified 1,083,745 discharges of patients with ARF by the presence of any of the following ICD-9-CM codes: 584.5 (ARF, with lesion of tubular necrosis), 584.6 (ARF, with lesion of cortical necrosis), 584.7 (ARF, with lesion of renal medullary necrosis), 584.8 (ARF, with other specified pathologic lesion), and 584.9 (ARF, unspecified); the most commonly used codes were 584.5 (ARF, with lesion of tubular necrosis [12%]) and 584.9 (ARF, unspecified [85%]). To avoid inclusion of patients who were admitted for initiation of hemodialysis for ESRD, we excluded 22,272 discharges with procedure codes for arteriovenous fistula creation (39.27, 39.42, 39.43, and 39.93). We further identified the subset of 132,890 discharges of patients with ARF-D by the additional presence of the procedure code for hemodialysis (39.95), which includes continuous renal replacement therapies such as continuous venovenous hemofiltration. Incidence of ARF and ARF-D and the associated in-hospital mortality were calculated for each year and during 5-yr periods. Other outcomes of interest were LOS and disposition at discharge (routine, transfer to short-term hospital, transfer to a skilled nursing facility [SNF], or discharge with home health care). Patient demographics included age (categorized in 10-yr intervals), gender, and race/ethnicity (non-Hispanic white, non-Hispanic black, Hispanic, Asian, Native American, other, and missing). We used the Deyo modification of the Charlson index (D-CI) (21) to estimate comorbidity (0, 1, 2, 3, 4, and 5+) but excluded AIDS from the index because diagnostic codes were not introduced until 1994. The D-CI is the sum of the weighted number of comorbid conditions based on 17 diagnostic categories identified from ICD-9-CM diagnosis codes. We used ICD-9-CM codes (see Appendix 1 for details) to identify other associated procedures (mechanical ventilation, coronary artery bypass grafting, cardiac catheterization and percutaneous coronary intervention) and diagnoses (sepsis, acute myocardial infarction, congestive heart failure, pneumonia, chronic kidney disease [CKD], acute pancreatitis, acute hepatic failure, and gastrointestinal hemorrhage). To identify diagnoses and procedures, we used year-specific ICD-9-CM codes, which are updated annually. All analyses were performed using survey procedures in SAS version 9.1 (SAS Institute, Cary, NC) or SUDAAN version 9.0 (Research Triangle Institute, Research Triangle Park, NC) to account for the complex survey design of the NIS. Frequencies, medians, and percentages were calculated and weighted to reflect national estimates. Data during the 15 yr were divided into three 5-yr periods (1988 to 1992, 1993 to 1997, and 1998 to 2002) and also presented by individual year. Continuous variables were expressed as medians with 10th and 90th percentiles; these were compared with the t test under the Central Limit Theorem instead of the Mann-Whitney U test, which is not available for survey analyses in SUDAAN or SAS. Categorical variables were expressed as proportions and compared with the Rao-Scott χ2 test. We compared in-hospital mortality over time by fitting a series of multivariable logistic regression models for patients with ARF and for patients with ARF-D. First, we fit unadjusted logistic regression models to estimate the odds for death for patients who were discharged in each of the two later 5-yr periods (1993 to 1997 and 1998 to 2002) compared with the earliest period (1988 to 1992). We then fit age-, gender-, and race/ethnicity-adjusted models and multivariable models, the latter incorporating the D-CI and the presence or absence of mechanical ventilation. We examined additional models stratified by the presence of major diagnoses or procedures that often accompany ARF and typically indicate a higher severity of illness (sepsis, pneumonia, acute hepatic failure, acute pancreatitis, gastrointestinal hemorrhage, acute myocardial infarction, coronary artery bypass grafting, cardiac catheterization and percutaneous coronary intervention, and mechanical ventilation). We conducted additional analyses stratified by CKD to explore differences between ARF with and without coexisting CKD. We considered two-tailed P < 0.05 statistically significant. To account for secular trends in the use of posthospital services, we performed sensitivity analyses to investigate the potential confounding effects of early discharge to SNF, which increased considerably over time. We ranked all patients who were discharged to SNF in 1993 to 1997 and 1998 to 2002 according to their predicted in-hospital mortality on the basis of a multivariable logistic regression model. We then ran multivariable models comparing mortality during the entire 15-yr time period after imputing “death” to varying percentages of patients who were discharged to SNF in 1993 to 1997 and 1998 to 2002. In this manner, we were able to estimate the required percentage of additional imputed in-hospital deaths among patients who were discharged to SNF to affect qualitatively the results. We determined the accuracy of ICD-9-CM codes for the identification of patients with ARF using linked administrative and laboratory data from two academic teaching hospitals in Boston. We compiled data from 19,206 inpatient admissions from two hospitals in 2002 and 7545 admissions from one hospital in 1994, the earliest year in which these data were available. We defined ARF as a 100% increase in serum creatinine (nadir to peak) during hospitalization. Against this definition of ARF, the code 584.x in 2002 had 29.3% sensitivity, 97.4% specificity, 91.5% negative predictive value, and 59.1% positive predictive value. In 1994, the code 584.x had 17.4% sensitivity, 98.7% specificity, 89.9% negative predictive value, and 63.5% positive predictive value. We identified 1,083,745 patient discharges of ARF in the United States from 1988 to 2002, corresponding to a weighted estimate of 5,563,381 discharges. We further identified the subset of 118,496 patient discharges of ARF-D, corresponding to a weighted estimate of 598,768 discharges. The demographic and clinical characteristics of the population of patients with ARF and ARF-D in the three 5-yr periods are shown in Table 1. The median age of patients with ARF and ARF-D was relatively constant during the 15 yr. Patients with ARF-D were on average younger than those with ARF. Overall, women accounted for 45.8% of all patients with ARF and 42.5% of patients with ARF-D. In 2002, the racial/ethnic composition of patients who had ARF and had nonmissing race/ethnicity data (72% of sample) was as follows: 68.4% white, 17.3% black, 7.5% Hispanic, 2.0% Asian, 0.2% Native American, and 2.2% from other racial/ethnic groups. During the 15-yr study period, patients with ARF had increasing degrees of comorbidity and severity of illness as reflected by the D-CI and need for mechanical ventilation. The percentage of patients who had ARF and had a D-CI of 3 or greater increased from 16.4% in 1988 to 26.6% in 2002 (P < 0.001), whereas the percentage of those with a D-CI of 0 declined from 35.1% in 1988 to 21.6% in 2002 (P < 0.001). In 1988, 18.0% of patients with ARF-D underwent mechanical ventilation, compared with 32.4% in 2002 (P < 0.001). The percentage of annual discharges with ARF increased from 0.4% in 1988 to 2.1% in 2002 (P < 0.001). Adjusted to the nearest census figures (1990 and 2000), the US population–-adjusted incidence of ARF rose from 61 per 100,000 population in 1988 to 288 per 100,000 population in 2002. Increasing incidence was observed for ARF as a primary and secondary diagnosis code and for both major ARF codes (584.5 and 584.9). For ARF-D, the percentage of annual discharges increased from 0.03% in 1988 to 0.20% in 2002 (P < 0.001), and the incidence rose from 4 per 100,000 population in 1988 to 27 per 100,000 population in 2002. The steady decline in annual in-hospital mortality for ARF and ARF-D during the 15-yr study period is shown in Figure 1. In-hospital mortality of patients with ARF declined from 40.4% in 1988 to 20.3% in 2002 (P < 0.001) and was evident in ARF as a primary and secondary diagnosis code and for both major ARF codes. For patients with ARF-D, in-hospital mortality declined from 41.3% in 1988 to 28.1% in 2002 (P < 0.001). In-hospital mortality for selected demographic and clinical conditions for the three 5-yr periods is presented in Table 2. We observed a consistent decline across strata of age, gender, race/ethnicity, comorbidity index, and a broad array of concomitant acute conditions. In-hospital mortality of ARF with CKD was lower than that for ARF without CKD, but mortality rates for both conditions declined during the 15-yr study period. 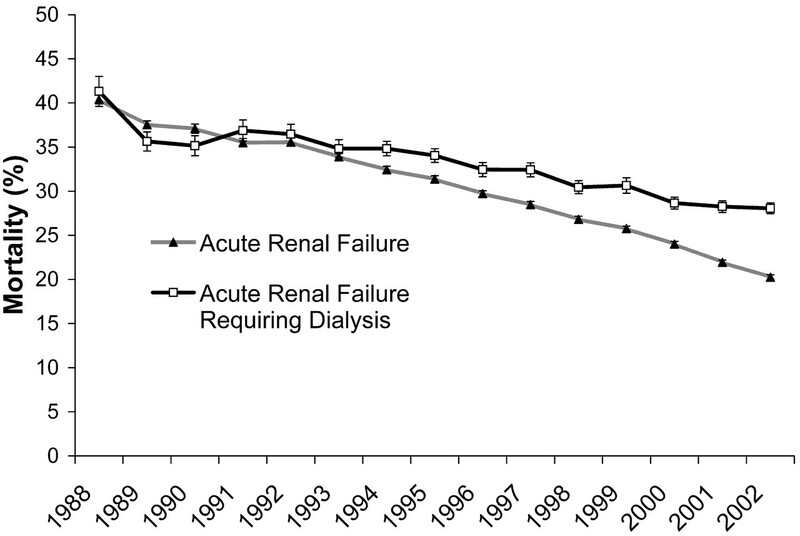 In-hospital mortality of patients with acute renal failure and acute renal failure that required dialysis from 1988 to 2002. Error bars denote SE. To evaluate secular trends over time, we compared unadjusted and multivariable-adjusted in-hospital mortality during the three 5-yr periods (Table 3). Compared with 1988 to 1992, the odds for death were lower among patients who were discharged with ARF in 1993 to 1997 (unadjusted odds ratio [OR] 0.76; 95% confidence interval [CI] 0.74 to 0.79) and in 1998 to 2002 (unadjusted OR 0.52; 95% CI 0.50 to 0.53). Adjustment for age, gender, race, and severity of illness accentuated the magnitude of the OR (1993 to 1997: multivariable-adjusted OR 0.62, 95% CI 0.60 to 0.65; 1998 to 2002: multivariable-adjusted OR 0.40, 95% CI 0.39 to 0.42). Similar results were observed among patients with ARF-D. In stratified analyses, we found statistically significant declines in in-hospital mortality across a spectrum of diagnoses and procedures for both ARF and ARF-D (Table 4). Table 5 presents the results of the sensitivity analysis to investigate the potential effects of SNF discharge on mortality over time. After assuming an in-hospital mortality of 40% for patients who had ARF or ARF-D and were discharged to SNF in 1993 to 1997 and 1998 to 2002, the multivariable-adjusted odds for death in these two periods remained significantly lower than in 1988 to 1992. At an imputed in-hospital mortality of 60%, the multivariable-adjusted odds for death in 1998 to 2002 remained significantly lower than in 1988 to 1992 for both patients with ARF and patients with ARF-D. Median LOS (10th and 90th percentiles) declined over time in patients with ARF, from 10.3 d (1.8 to 33.3) in 1988 to 7.0 d (1.8 to 22.3) in 2002 (P < 0.001). Among patients with ARF-D, median LOS declined from 14.3 d (3.2 to 39.6) in 1988 to 11.9 d (3.4 to 33.8) in 2002 (P < 0.001). Discharge to SNF became increasingly more common during the study period in patients with ARF and those with ARF-D. Overall, 10.9% of patients with ARF were discharged to SNF in 1988, compared with 26.4% in 2002 (P < 0.001). Among patients with ARF-D, 6.7% were discharged to SNF in 1988, compared with 23.1% in 2002 (P < 0.001). Using a large, nationally representative database of US hospitalizations between 1988 and 2002, we found a marked increase in the incidence of ARF and ARF-D and a significant decline in in-hospital mortality. Other notable trends during this 15-yr period included increasing comorbidity and severity of illness, shorter LOS, and more frequent discharge to SNF. We found a more than four-fold increase in the population-adjusted incidence of ARF and more than six-fold increase in ARF-D between 1988 and 2002. The extent to which changes in ICD-9-CM coding practices, or “DRG creep” (22), contributed to these substantial increases is unclear. Underascertainment of ARF in the early years of this study is likely, given the comparability of mortality rates between ARF and ARF-D from 1988 to 1994. During the later years, in-hospital mortality between these two groups diverged, possibly as a result of more frequent coding of less severe cases of ARF. In our validation study, we confirmed an increase in the sensitivity of the ICD-9-CM code for ARF between 1994 and 2002, suggesting that coding practices for ARF indeed have changed. Possible reasons for increased ARF coding over time include increasing physician awareness of less severe ARF, reimbursement considerations (23), and increasing number of available fields for diagnosis codes (24). However, an increase in coding of ARF (i.e., increased sensitivity) alone is unlikely to account for the observed increase in ARF incidence. For example, if 15% of actual ARF cases were coded correctly as 584.x in 1988 (i.e., sensitivity of 15%) and the population-adjusted incidence of ARF remained constant over time, then >70% of cases would have had to be coded in 2002 (i.e., sensitivity of 70%) to account for the observed incidence in hospitalized patients. Although we found that the sensitivity of ARF coding increased somewhat between 1988 and 2002, the increase was not nearly to this extent. A decline in specificity over time also would increase the observed incidence of ARF, but we found a small increase in specificity in our validation study. The identification of ARF-D may be less susceptible to undercoding and changes over time, as major procedures such as dialysis tend to be coded accurately (25). The increase in ARF-D incidence may reflect changes in physician practice patterns regarding willingness to initiate dialytic therapy in increasing numbers of patients with ARF. Another explanation for the increase in ARF-D incidence is that severe ARF may be more commonly observed in modern medical practice. The increasing disease severity and comorbidity of the hospitalized population, expanded use of percutaneous coronary interventions (26) and coronary artery bypass grafting (27) in older and sicker patients, and increasing incidence of sepsis (28) among other factors could be contributing to these trends. We observed a statistically significant decline in in-hospital mortality among patients with ARF and ARF-D between 1988 and 2002, despite an increase in comorbidity and severity of illness. Improvements in survival to hospital discharge were documented across a broad range of demographic and clinical conditions and were not due to rising rates of discharge to SNF; short-term mortality in patients who were discharged to SNF would need to have exceeded 60% to challenge the conclusion that mortality rates that are associated with ARF and ARF-D have declined. The 60% figure is far in excess of mortality rates that have been reported in extended-care facilities for elderly patients with delirium (25% 6-mo mortality) (29) and critically ill surgical patients with Acute Physiology and Chronic Health Evaluation II scores ≥20 (approximately 22% 1-mo mortality, 50% 2-yr mortality) (30). The significant decline in mortality associated with ARF could be explained in part by changes in coding practice, with less severe cases of ARF being recognized and coded in more recent years. However, we doubt that changes in coding practice could reasonably account for the decline in mortality observed among patients with ARF-D. There is no reason to suspect that coding of dialysis has changed over time or is associated with the probability of in-hospital mortality, as would need to be the case to account for our results. The statistically significant reductions in ARF-D mortality in stratified analyses of various concomitant medical conditions further supports the validity of our findings. The increase in ARF-D incidence raises the possibility that dialysis increasingly is being performed on less severely ill patients with ARF, thereby leading to a reduction in observed mortality rates; however, we found the opposite to be true, with increasing comorbidity and severity of illness over time. Previous studies that examined trends in ARF-associated outcomes have yielded a spectrum of conclusions, with reports of a decline (11,12,14,16,17), increase (15), and no change in in-hospital mortality (13). These studies generally have been limited by relatively small sample sizes and reliance on a single center’s experience. In contrast, our findings reflect outcomes from a large number of discharges drawn from a 20% stratified sample of US hospitals. The trend toward improved ARF-associated survival over time may be due to overall improvements in the quality of health care (31), especially in light of similar observed trends in patients with sepsis (28) and acute respiratory distress syndrome (32). Among patients with ARF-D, advances in technology and changes in dialysis practice (e.g., high-flux “biocompatible” membranes , continuous therapies , attention to the delivered dose of dialysis ) may have contributed to enhanced survival rates; this area deserves further investigation. This study has several strengths, most notably its large sample size, 15-yr duration, and the generalizability achieved by use of a nationally representative database (28,36,37). Potential limitations arise from the fact that the database itself has changed over time in two potentially important ways. First, the mean number of diagnosis codes increased from 3.2 in 1988 to 5.4 in 2002, possibly as a result of an increasing number of fields for entry of diagnosis codes over time. This trend may have contributed to the increased identification of ARF and comorbidities over time. However, Iezzoni et al. (24) demonstrated that an increase in the number of reported conditions did not by itself improve the identification of comorbidities that are used to assess risk for death in administrative data. Second, the number of states and the proportion of the US population that was covered in the sampling frame increased from 8 in 1988 (31% of the US population) to 35 in 2002 (87% of US population); these changes were unlikely to influence the findings materially, because we observed generally smooth and consistent trends across years as states were added. The major limitations are the absence of detailed laboratory and clinical data, inability to track individual patients to account for re-admissions, and the reliance on ICD-9-CM codes for identification of ARF and ARF-D. Quan et al. (38) found that ICD-9-CM codes for acute and chronic renal failure were 42.2% sensitive and 99.1% specific, using chart review as the gold standard. In another study, Quan et al. (25) found that the procedure code for hemodialysis was 76.9% sensitive and 99.9% specific. Our validation study confirmed the low sensitivity but high specificity of ICD-9-CM codes for ARF. Further support of the external validity of our results comes from the comparability of our estimates to previous reports. For ARF, this is difficult to gauge given the multiplicity of definitions used in previous studies. The incidence that we found for ARF-D is consistent with a previous study from the United Kingdom (39). Moreover, our estimate from 1998 to 2002 of in-hospital mortality for patients who had ARF-D and required mechanical ventilation was 60.2%, which is comparable to previous reports for patients who were admitted to the ICU (1,2). During a 15- yr period we found an increase in the incidence of ARF and ARF-D and a decline in mortality. The rising incidence of ARF will increasingly strain an already burdened health care system with patients in need of resource-intensive interventions such as dialysis. Despite declining mortality rates, outcomes that are associated with ARF remain unacceptably poor. New strategies for the prevention and treatment of ARF are desperately needed. The results of this study were presented as a Free Communication at the American Society of Nephrology Meeting; November 11, 2005; Philadelphia, PA.